Perhaps it's the season, or the fact that it hasn't been above 40 degrees in six weeks here in Sun Valley, or that squash from Idaho's Bounty is incredibly inexpensive, but I've made another squash soup. 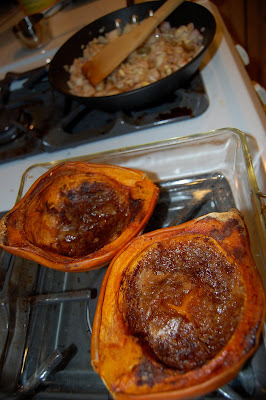 I started with a small butternut squash (one that was almost acorn-squash-shaped rather than oblong), cut it in half, removed the seeds, and placed the halves in a baking dish. I added about a tablespoon of butter in pieces, a tablespoon of brown sugar, and heavy sprinklings of cinnamon and red pepper powder (still trying to use up the joint spice cabinet). I baked that at 350 for, oh, two hoursish? Until it smelled really good and was soft to a fork, anyway. When that was done baking, I removed the dish and let it cool. While the squash was cooling, I sauteed about half a white onion, two or three shallots, and half a head of garlic (all chopped fairly fine) in about a tablespoon of olive oil and half a cup of white wine. Once the onions were half sauteed, I added more cinnamon and some smoked paprika (probably about a tablespoon or two of each). Once the whole mess was lightly browned, I put it in the Cuisinart. I added the flesh of the squash, and about three cups of the pureed potatoes that were such a failure in that last post (they had been in the freezer). As the contents pureed, I added a bit of heavy cream. Probably less than a total of a cup, but I'm not sure, I just poured until it looked right. Out of the Cuisinart and into a medium-sized pan, I added a bit of vegetable broth to thin out the consistency. Again, probably a total of a cup or so, but I'm not sure. Also, a teaspoon or two of black truffle oil. As you can tell, I tend to cook by the seat of my pants, (today, the new jeans I won from Lee off Facebook!) which makes me a poor baker. There was some toasting and buttering of San Francisco sourdough slices going on as I served up the soup. Thinking about visual and textural contrast, I diced up some cilantro left over from our elk fajitas last weekend. That went onto both bowls, and some grated reggiano onto my bowl (but not the fiance's). He said the cilantro could have been sliced finer, as it created too much of a textural inconsistency, but I liked it. Eh, to each his own. 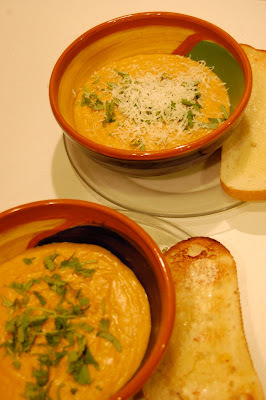 For another soup recipe, check out Kelly's Carrot Soup, by clicking here.